Over on Facebook Scott Dunbier remembers Joe Kubert and his Artist’s Edition experiences. Joe Kubert did Tarzan when I was a kid. It was, to me, the definitive version of the character. You guys can squawk about Foster and Hogarth and Buscema all you want (as GREAT as, um, two of them were, lol) but Kubert was the king to me. Tarzan was also the very favorite thing he ever did. I know that for a fact because he told me so himself. I still remember the day when I called up Peter Carlsson, Joe’s right hand man at the Joe Kubert school, and asked him if I could talk to the two of them. Pete had me hang on and transferred the call to Joe’s office and then they put me on speakerphone. We had made an arrangement already to do an Artist’s Edition of his TOR since Tarzan was unavailable. Joe, right to the point, asked what was up. I said to him, “Joe, TOR will have to wait, I got the rights to Tarzan, we’re going to an Artist’s Edition of it.” I’ll never forget his response, he said, “Really…?” his tone was like a little kid at Christmas, he was so happy, which made me even happier. 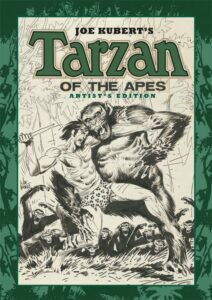 I’ve talked about this before, but Tarzan was part of my own personal holy trinity as a kid, along with Jack Kirby’s Kamandi, and Archie Goodwin & Walter Simonson’s Manhunter… for me, these books WERE comics (they still are). So we started work on the Tarzan AE. Sadly, Joe never saw the published book, but he was able to review the PDFs and approved all of it. We planned on doing a remarqued edition of the book with 250 sketches drawn on a sketch plate to be bound into it. Around this time Joe got sick. He went into the hospital. He was doing better, they thought he would be getting out soon, but then took a turn for the worse. At one point I called up Pete and asked him how Joe was doing. Pete said, “Don’t worry, Scott, Joe has the sketch plates and is working on them in his hospital room.” I remember being incredulous… I said, “Pete, I don’t give a damn about the drawings, tell him to knock it off and just concentrate on getting better!” Pete waited patiently for me to finish and then said, “YOU try and tell Joe Kubert NOT to draw.” I couldn’t really argue with that, that was Joe Kubert. Aside to Pete… please let me know if I got any of this wrong. Joe Kubert died shortly after that—one of the all-time greats—having finished about 170 or so sketches—drawing to the very end. I’ve included the complete text as it’s from social media and not sure everyone has access. Please check the post for some engaging comments.